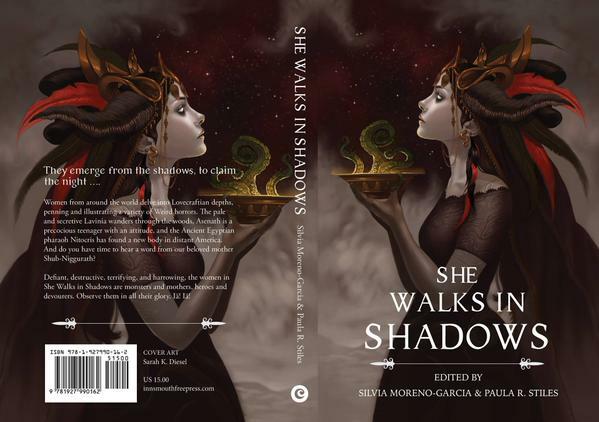 Silvia Moren-Garcia and Paula Stiles are editors of the new anthology She Walks in Shadows, an anthology of Lovecraft-inspired stories by women authors. 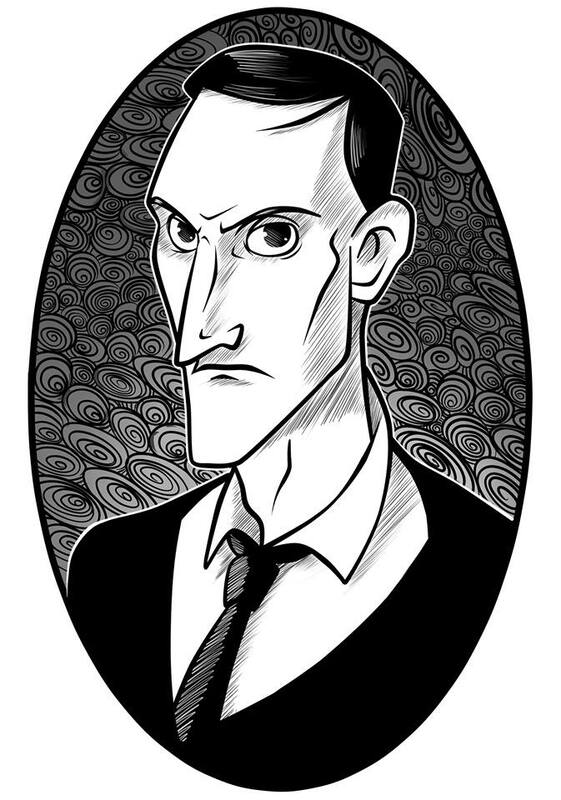 Silvia and Paula were kind enough to answer a ton of email questions I posed to them about Lovecraft’s enduring legacy, dealing with race in his work, and the fact that duh of course women can write stories based on the Lovecraft mythos. The anthology is available from Innsmouth Free Press. Paula: Silvia and I got tired of hearing, “Chicks don’t/can’t write in the Lovecraft Mythos,” and of talking repeatedly about authors like C.L. Moore, who wrote Mythos stories with female protagonists (Jirel of Joiry) during Lovecraft’s lifetime. 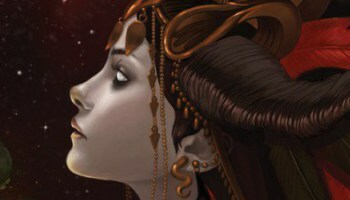 So, we decided to do an entire anthology of Lovecraft stories, written by and about women. We figured if that didn’t make our point, well…. Silvia: Author Molly Tanzer, who appears in the anthology, can vouch for this: at one point someone on Facebook said women were biologically incapable of writing Lovecraftian fiction. How did you select the stories for this anthology? What kind of things were you looking for in terms of style,tone, and content? Silvia: The main interest was to find stories about women, since women don’t really appear in Lovecraft’s fiction. They only get a more prominent role in his “collaborations” with Zealia Brown-Reed Bishop. So there is this odd vacuum. Paula: Aside from the main premise–stories by and about women–we wanted to get as wide a variety of stories from as wide a variety of women as we could get. Different countries, different cultures, different time periods, different Lovecraft stories and characters used, LGBT characters, different types of plots, different styles, even different types of POV. If you don’t like one story, try another. We wanted to show that women not only can write Lovecraftian stories, but that they can write a variety of them. Why does Lovecraftian horror continue to have such a huge influence on fiction and culture? Silvia: Part of it is the open quality of it. People can contribute to this universe in ways you can’t, to say, Lord of the Rings, even if there are LOTR pastiches. Paula: Well, in some ways, it’s like vampires or zombies–it’s a fad. I was involved with a Permuted Press and other zombie-lovin’ folks a few years ago when zombies were white-hot, published a few zombie stories, some reasonably well-regarded. That kind of thing takes on a life of its own. But then you look at these fads and they’re perennial. Some tropes and themes come up over and over again. Lovecraft pops up, I think, because he’s almost unique, both in the Pulp Era and today. Sure, he had antecedents, but there’s a bleakness to his work that was brand-new in his time and is rarely paralleled today. Lovecraft didn’t invent the cursed tome or the doomed narrator or even the Thing-I-Can’t-Describe-Or-You-Dear-Reader-Would-Go-Mad, but he did almost singlehandedly invent scientific cosmic horror. The other thing is…well, I’ll answer that in the next question. Lovecraft was famously racist and sexist – how might a modern fan approach the more problematic elements of his work without excusing or glorifying them? Paula: Well, as I said above, this is a corollary to the previous question. First of all, Lovecraft was certainly racist and arguably sexist (though more in the avoidant form of not talking much about women than in actively negative portrayals), in both his public and private writings. But the sexism doesn’t change the fact he was henpecked his whole life. It was also pretty vanilla compared to some of the virulent stuff going on with women in his lifetime (or his views on race, for that matter). Even female writers of the time struggled with a good deal of self-hatred and limited horizons compared to women today. As for the racism, that’s a lot harder to handwave. While I can find my gender’s being represented by the likes of poor doomed Lavinia Whateley and Asenath Waite irritating, some things Lovecraft wrote about race (and we’re talking about the premise of entire letters or even published stories) were hurtful then and are hurtful now. That said, you’re also talking about contemporaries of Lovecraft like the KKK and the Nazis who not only talked in racist terms, but did some really terrible things to promote their racist views. So, the bar for Worst Racist Ever of the early 20th century is set pretty high (or low, as you fancy the metaphor) and Lovecraft doesn’t even come close to meeting it. I also find it curious that Lovecraft gets singled out for the sexism and racism labels, when more successful contemporaries like Robert E. Howard and Edgar Rice Burroughs had equally nasty things in their stories that are unpleasant to read today. Conan and Tarzan remain very popular, and people basically gloss over the more problematical stuff. I think that while he came to conclusions many of his readers find objectionable today, Lovecraft explored the idea of exploring race in horror, rather than just having racist stereotypes for the stalwart Heroes to beat, more deeply than his contemporaries or even writers today. As such, he came up with tools that are still useful today in writing stories from a more diverse perspective. Lovecraft really knew what it was like to be an outsider. Another thing that makes it easier to use Lovecraft’s work than some of his contemporaries, I think, is that Lovecraft’s protagonists are such losers–neurasthenic little men who aren’t too popular with the neighbors. The winners in most of Lovecraft’s stories are the monsters, the bad guys, the cult leaders, those creepy people who scared him so much. We don’t have to deal with the Myth of White Superiority in Lovecraft’s works, the way we do with Howard’s Conan or Burroughs’ Tarzan. That makes it rather easy to turn it around and write stories where the monsters, bad guys, and cult leaders *are* the Heroes. Or at least the protagonists. In a weird way, in Lovecraft’s original stories, they almost already are. Look at the Hero of “The Shadow over Innsmouth.” Look at how much more interesting he becomes when he learns to stop worrying and embrace the racial taint that calls him to the sea. Silvia: Lovecraft made some sexist statements in his letters early in his life, but he seems to have grown out of it. He certainly recorded his admiration for several women writers, corresponded with women, and thought highly of his mother and aunts, who raised him. He didn’t outgrow his racism. My research is in eugenics and around this time period scientific racism, eugenics, it was all the rage. You can see IQ tests of the time period where we are “objectively” told that “science” has determined black people and other people who are also racialized, like certain European populations, say Eastern Europeans, are not as intelligent as certain white people. Lovecraft did not come up with these ideas out of thin air. The important thing when it comes to Lovecraft is two-fold: one, this racism seemed to manifest in a way that was crippling to him. Most racist people can go on with their daily lives without going into fits, like Lovecraft did. His wife describes him basically having panic attacks when he encounters visible minorities on the street in New York. His racism is probably the main element which wrecked his marriage. So it’s something very, very heavy laying on Lovecraft psychologically. And it ties to notions of race, but also of class and manliness. Lovecraft was terrified because in many ways he was unfit, he was that dreaded Darwinian horror. The other important thing is his biological and racial concerns manifest in his fiction in a way that is not manifested in the fiction of other racist writers. Henry James had some nasty thoughts about immigrants and some of his unpleasant thoughts on Jews certainly make it into his fiction, but it’s all in a very muted way compared to Lovecraft. With Lovecraft it’s very obvious, very palpable and it’s a terror which seems to have a different kind of quality because even though you see a lot of images of evil Asian men, for example, on covers of magazines, it’s a terror that is always ultimately vanquished by the good white hero. But the funny thing about Lovecraft is the good white hero normally perishes. The Other takes centre stage in Lovecraft’s fiction in a way that it doesn’t with other writers. And it’s a bit like Julia Kristen says in Powers of Horror: An Essay on Abjection. The abjection is about rejection, but in rejecting something you necessarily conjure it. The abject is a threat which threatens to breakdown order but it can never be completely eliminated. We are both drawn to and repelled by the abject and it does not abandon us. Modern writers can tackle abjection, can tackle Lovecraft’s cosmic horrors, and a myriad of other elements, and they need not do it with the same racist colours Lovecraft used. I mean, to be perfectly honest, *most* of science fiction, fantasy and horror has very racist and sexist roots. I understand this, I know it, I react to it, I produce new stuff. I’m not going to write another “The Queen Bee.” I’m referring to the story by Randall Garrett, published in 1958. Some white supremacists seemed upset when they viewed a panel on racism and Lovecraft I was in, which was posted on YouTube. Some people are upset we did an all woman anthology. But ultimately Lovecraft does not belong to me or you or anyone. Writers can respond to him in their own way and that’s the beauty of it. We have more than half a dozen POC writers in this anthology writing their version of cosmic horror, of Lovecraft’s Mythos, of Weird fiction. I think that’s awesome. This entry was posted in Interviews and Special Guests and tagged Cthulhu, Inns mouth Free Press, Lovecraft, Lovecraft and race, Lovecraft and women, Lovecraft anthology, Paula R Stiles, women write Lovecraft.